So this problem has stunned me for days. I actually went out and tried 3D Coat and Mudbox. But after a while I realized that sticking with less software packages is a more efficient way to work. I've just today noticed the Re-Projection function inside Substance Painter, it's brilliant. But unfortunately it didn't work the way I expected. What I did is outputing 2 different model for my project. One is fully unwrapped without any mirroring geometry; The other one is the fully unwrapped one, cuts off one side of the geometry and mirrored. Why I do this is that I wanted to have one mesh with mirrored two half of geometry using same UVs, to achieve the symmetry for stencil works. But the ideal result is to have a model with seperated UV for both half, so decals and texts don't have to mess up. I assumed the reprojection works just like transfer bake in Designer. But I am wrong. I tried to paint on the MirrorUV object first, then I load the final mesh, and it automatically starts re-projection. And what happened is, it only projected one side of the mesh. I don't know exactly why, but I realized it doesn't work the same way as Transfer Bake. At least now I know for a fact there is only one other way to solve this problem. Transfer bake in Designer. And it just start getting frustrating again. Because the result I wanted is a symmetry, so I have to not only transfer bake one texture, but all of them. And a model can have more than 2 or 3 UV sets. If it wasn't that I have to manually set up every bake for every texture, I'd be happily doing so without any complaint. But such usability issues is killing my working efficiency and morale. I mean, maybe I expected too much from Allegorithmic, but I thought those functions were common sense among this kind of software. Will there be any improvements or updates to stencil-symmetry support, or multi-texture transfer bake/baker profile in 2015? I'm not sure I understand exactly what you want to do, but why don't you simply use the Symmetry tool inside Substance Painter? Regarding the reprojection, here is how it works: it keeps all the strokes/actions in memory in the screen space, and project them again on the mesh. So if the UV are totally changed on the new mesh, it will mess things up. What I wanted to do is simply Paint with Stencil, but in a way that it gets mirrored onto the symmetrical other side of the model. I use stencil as a mask, and I create custom stencils that contains Sci-Fi shapes and Straight/Curved Lines etc. I'm creating a workflow that does not involve complete highpoly model for every detail on the object. I paint in details on a more painterly fashion with PBR so to reduce the time and cost of my projects. Plus, painting is more fun than making highpolys then find out that it doesn't fit the lowpoly. I can use the symmetry tool, but it's impossible to draw out the shapes with perfect height information without using stencil tool. Plus with Substance Designer, creating stencil maps with the ease of adjusting the slope on the height IS extremely helpful. Lots of hardsurface shapes and height informaition can not be replicated with paint stroke. I know it's easy to make them in the highpoly, but as I previously mentioned. 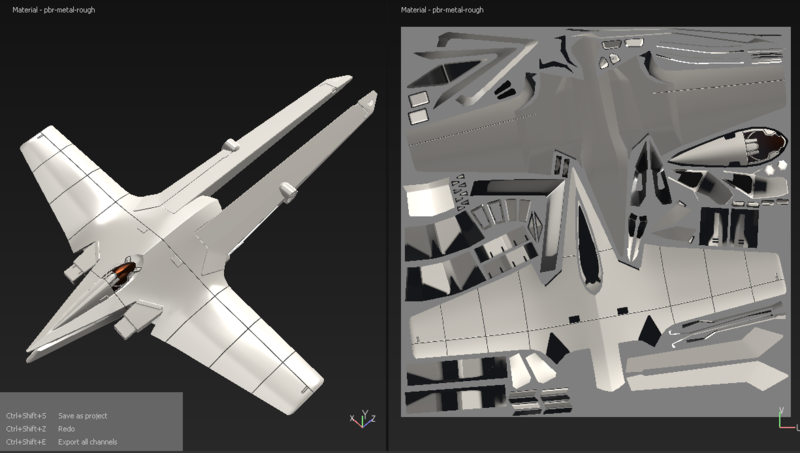 I wanted to create a workflow for my project with minimal highpoly model involvement. With current symmetry support I can only do much, drawing some cut lines, rectangles, Polygon shapes. I could have benefited from using a symmetry support with stencil to create perfect circles, holes, any interesting shapes I might come up with. Stencil-symmetry support <-- That's what I'm trying to get help with. I've posted several posts about it, I didn't get more information than it's just not supported yet. I want to know if there is ever a plan to implement it, and when can we expect to be able to actually use this feature. And, if that's not coming soon. Is it possible for us to have the ability of quickly Mirror the texture along the world axises onto the other side? with a click of the button? Or just being able to transfer bake all textures at once instead of one by one? PS: When I purchased the software I expected that symmetry would work with all tools that this package offers. And this problem that stencil doesn't work with symmetry has never been clearly noted in any source of information I can find. It's a major let down for me despite that everything else was totally amazing. Please at least give us some hope. Getting stuck on a workflow I've thought through for a while now is demoralizing... I really don't know when I can actually get on track making satisfying stylized models and assets for my project. Fixing the stencil symmetry is definitely on our to-do list. Although I don't have an ETA to give it should be part of one of our bug fix sprints this summer. That is one of the great news to hear. I'm glad you guys are looking to add the stencil symmetry support. Hope you all the best, and have a good summer!